Deed Poll Office is a trusted firm of paralegals specialising in name change law in the U.K.
We are experts on all matters relating to deed polls and changing your name. You can use our site to find out how to change your name — and what kind of document you’ll need. Any deed poll we issue is guaranteed to be accepted by all government bodies and other organisations in the U.K.
We’ve made the process of changing your name as simple as possible, and if you need any advice we’re on hand to help. Our mission statement is to provide the best service with complete honesty — and for a fair price. What a knowledge­able user-friendly office! Where’s the “official” deed poll website? Changing your name in the U.K. is a legal matter — so there’s no such thing as an “official” issuer of deed polls. * UK Deed Poll Office London charge £ 15 for a deed poll, and an extra £ 1 for an A4-sized envelope. If you didn’t pay the extra charge of £ 1, they would fold the deed poll and put it inside a smaller envelope. We have added the additional price of £ 1 for a direct comparison. 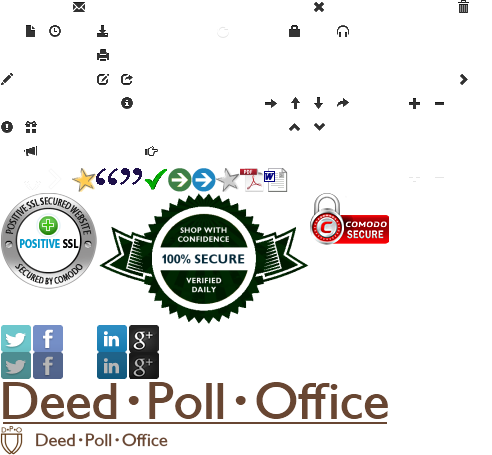 ‡ ukdp / DeedPoll.com claim that you will “have your deed poll within 3 working days”, and the despatch time shown is based on a delivery time of 1 working day (Royal Mail claim to deliver 93% of 1st Class mail the next working day after posting). ‡‡ These companies include 1st Class postage in their advertised price, so we have subtracted £ 1 for a direct comparison. * UK Deed Poll Office London charge £ 15 for a deed poll, and an extra £ 1 for an A4-sized envelope. If you didn’t pay the extra charge of £ 1, they would fold the deed poll and put it inside a smaller envelope. We have shown the total price of £ 16 for a direct comparison. Our application form is very clear and simple, and it will guide you to fill in all the correct information we need to process your application. 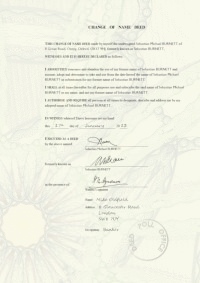 We will then prepare the correct documents you need to legally change your name. You can use your deed poll to update all your official documents in your new name, such as your passport, driving licence, bank account, and so on. Deed polls issued by Deed Poll Office are guaranteed to be accepted by all government bodies and other organisations in the U.K. Note that a deed poll is not the only way of changing your name, and — depending on your situation — you may not need a deed poll. Our site contains detailed information about legally changing your name. If you have any questions, or you would like more personal advice, you can get in touch with our support service, and a deed poll adviser will be glad to help you. Please note that we do not provide a service that helps you trace your family tree — the deed polls we issue are private documents, and our records are not available for public inspection. For further information about searching for historical changes of name, you can read about other possible sources of historical records, or else get in touch with a genealogist.